The cast of The Titanic Orchestra didn't know Barbra Berlovitz, an icon in the Twin Cities theater scene, before they auditioned for the play she is guest directing at Augsburg this spring. None of the students had attended a production at the Tony award-winning Theatre de la Jeune Lune, where Berlovitz was the co-artistic director for 25 years. But the entire cast agrees that working with her has been a valuable experience in their development as actors. Justin Caron, a junior theater major, said Berlovitz is a master at bringing out an actor's unique talents. "She's good at getting people to make new discoveries without telling them exactly what to do and working with the talent we have and trying to make that come out," Caron said. As the "senior" member of the cast, Caron said he has been in between 5 and 10 productions at Augsburg and has worked with three different directors in each academic year. "Each of them shapes your skills in different ways, teaching you new techniques," he said. "It's good to get a new perspective, especially in a college theater program where it's education built in with the professional setting." Hannah Youngquist, a sophomore theater major, says working with Berlovitz has been "breathtakingly, terrifyingly great." What is breathtaking, Youngquist said, is Berlovitz' experience. "She has been in theater for 30 years, and she does things and says things I never would have thought of," Youngquist said. And it's Berlovitz' professional caliber that is terrifying "in a friendly way," Youngquist said. "She has a Tony, so there was a little bit of a star struck thing for me. She puts pressure on me to do well because she thinks I can do well, and I appreciate that." Youngquist, who plays a male character, said Berlovitz has pushed her to do more with character development and technique than she ever has done. "She doesn't let anything drop. Every movement and action has a motivation." Boo Johnston, sophomore theater performance major, said she appreciates that Berlovitz lets actors make their own decisions. "She doesn't constantly reaffirm your choices but trusts you to make decisions for yourself. And when she does give feedback, it's more of a suggestion than a direction," Johnston said. 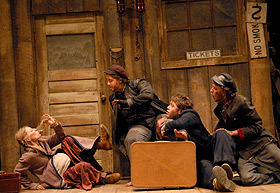 This is Johnston's first production at Augsburg and the first "straight" non-musical theater production she's done since 2008, so it has been challenging for her in that regard. Berlovitz is also her instructor in Voice for the Stage this semester, so she has been working to take the lessons she has learned in class to the stage. This is the fifth Augsburg theater production in which Isaac Kronlokken, a sophomore theater major, has been involved. "When you work with certain directors and instructors, you know what to expect most of the time. With a guest director, you get different input and learn different techniques," he said. Berlovitz has also encouraged Kronlokken to experiment as an actor "In past productions, I was very timid," he said, "and Barbra has kind of given me the green light to try new things." The Titanic Orchestra is the third project Berlovitz has directed at Augsburg College. In addition to guest directing, she is teaching Voice for Stage/Speech/Screen and Creative Drama. Her other projects can be seen on the Theater Department Flickr photo stream. Read more about Berlovitz and watch an interview with her on the Theater Department website. April 13, 14, 19, 20, 21 at 7 p.m.